Vox Model V847 Wah-Wah Guitar Pedal Reissue Pro Wah Effects CH11035 Revision 2. Vintage 1990’s made in the USA. Up for sale is VOX v847 wah-wah pedal ( ch11035 rev.2 ) from 90s made in USA. The tone monster! This is a dream pedal for true Hendrix, SRV, Page and Clapton fans. Based on the specifications of the original pedal developed by VOX in the '60s. The pedal’s inductor has undergone a redesign to be closer in specification to the original VOX wah inductors, for improved dynamics and tone. THIS IS THE MUCH MORE DESIRABLE VERSION-BATTERY POWERED, NOT A/C! 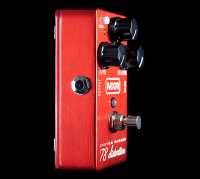 MXR 78 Super Badass Distortion Pedal made in the USA. 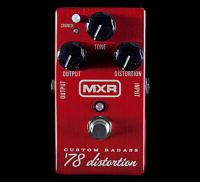 MXR Custom Badass '78 Distortion Pedal at a Glance: Hot-rodded circuit gives you big-time distortion tones, from a road-friendly box Get rich, massive rhythm tones and over-the-top leads CRUNCH button boosts the harmonic content. Hot-rodded circuit gives you big-time distortion tones, from a road-friendly box MXR knows their pedals. They also know how to get the absolute most out of the insides of those pedals. They took a classic distortion circuit, hot-rodded it, and housed it in a rock-solid metal housing. The result? You can stomp on a Custom Badass '78 Distortion for tour after tour and it'll keep on pumping out massive distortion tones.